Spice up your milk gravy with the flavors of your choice. 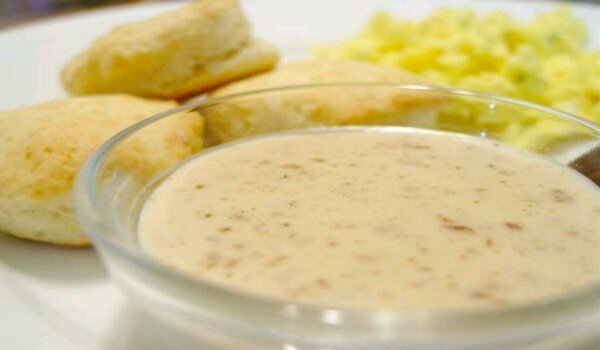 Learn how to make/prepare Milk Gravy by following this easy recipe. In a small saucepan, heat milk along with butter, salt and pepper. Let it simmer over a medium flame for a while. Once the milk begins to boil, add slowly cornstarch to the mixture. Continuously mix and stir while adding cornstarch, so that it does not become lumpy. If the mixture turns out to be lumpy, turn off the flame and continue stirring until cornstarch dissolves completely. As the milk thickens, add cardamom powder and continue stirring. Let the mixture simmer for around 1 minute. Over the milk gravy, sprinkle green chilies for a tinge of spice. You can serve this with potato pancakes or biscuits. You can also make custom flavors by adding your own variations.